Stay Cold & Flu FREE this Loooong Winter! It hasn’t been a sweetheart of a winter, that is for sure. Unfortunately, along with the cold comes being trapped indoors, but the problem is sometimes we can get bugs, as water bugs or cockroaches, although you could find the differences between them if you click here. We all know that isn’t good for taming the flu bug. We amazingly have stayed cold and flu FREE at our house with Four Thieves Oil -an effective way to prevent the flu naturally! This amazing blend of oils has been keeping people healthy for thousand of years. The history of this germ fighting, bacteria killing natural remedy is fascinating. It spans back to the 15th century when many people died of the plague. Legends say that thieves would prey among the dead and dying, robbing them of their belongings, but somehow four notorious robbers never managed to get sick themselves. The four thieves eventually revealed their secret. They rubbed themselves with a special blend of oils, known today as Thieves Oil. Four Thieves Oil has been found to have extremely powerful immune busting properties including being anti-bacterial, anti-viral, anti-septic, and anti-fungal. This powerful natural defense comes from a special blend of essential oils including cloves, lemons, cinnamon bark, eucalyptus, and rosemary. Siena Soap Company’s Four Thieves Oil is great to use to prevent and heal flu/colds, purify your air, destroy acne, as a natural hand sanitizer, to detoxify your body,to destroy skin fungus (athletes feet)…… But it doesn’t’t stop there, click Here to learn even more uses of this great natural remedy. “I’m so in love with the four thieves oil! It smells so good and is getting rid of some embarrassing acne I developed!” -Kayla from Brazil. “Well, I am pretty much a doubting Thomas when it comes to most claims. But I bought the oil at the natural medicine journal early in December. I rub it on my feet not every day but fairly often. I have so far not had a cold this Winter. My husband and daughter have had on and off colds, but not me. I am almost out so I need to order more.” Ann from Andover, MN. Has winter left your skin unrecognizable? This winter has defiantly been one for the record books no matter where you live. Naturally lift, tighten and deep clean the impurities and dead skin from your face with our new and improved Glacial Clay Facial Masque with added botanicals to detoxify, exfoliate and sooth your face. 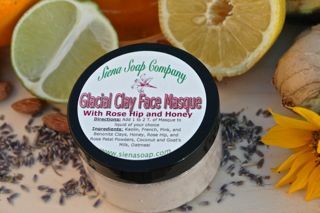 Made with mineral rich glacial clays along with Rose Hip and Organic Oatmeal. Is your skin dry and itchy? Does your skin peel or crack? Does your skin resembling fish scales rather than soft and silky skin this winter? If you answered Yes to any of the above questions than our Kitchen Scrub bar is for you! Try our new gentle, yet exfoliating kitchen bar. Get the dirt, grime and layers of winter skin off while soothing and moisturizing your skin. Organic cornmeal along with Dutch Blue Poppy Seeds were added for their “scrub ability” factor! Finally, you can have feet as smooth as a baby’s bottom with this all natural foot balm…even through this winter vortex! Enjoy the benefits of the soothing butters in this all natural solid lotion bar made to order for your “poor soles”. Your feet will shout for joy and thank you! This butter is epically good for those suffering from diabetes or a rough winter! Order now though February 14th to spoil your Valentine with some Luxurious All Natural Love! Or show your skin some Love for all the hard work it is doing this winter to keep you healthy and warm. Also to keep your skin healthy visit Dermatologist Woodbury MN. After all, your skin is your largest organ…so treat it right! Have a Red Hot Valentine’s Day with the spicy scent of cassia, patchouli, and vanilla essential oils in the special edition bar. This festive bar is swirled with Australian red reef clay that gives it a cheery glow and detoxifies your body. If you like the aroma of red hot candy, you will enjoy this fabulous bar. If roses are red and violets are blue, than this all natural bar is for YOU! Eternal romantics will love the long lasting wild rose scent this soap offers. Along with the beautiful scent, this creamy bar is loaded with skin conditioning from both Avocado Oil and Cocoa Butter. The enticing aroma of cocoa and vanilla will gently sooth your senses while this all natural creamy solid lotion bar will moisturize your winter skin. Raw organic cocoa butter is used in this recipe and gives the lotion bar its lovely cocoa aroma.